To qualify for most hospice care programs, patients must have a terminal diagnosis and an expected prognosis of six months or less. Patients at any stage of their life span may enter, but because of the requirements, most hospice patients are seniors who are dealing with an advanced-stage cancer or chronic disease. Seniors often begin to consider hospice once they have exhausted their potentially curative treatments. They may also turn to hospice if they are not candidates for traditional treatments because of their age or late-stage diagnosis. Once patients decide that a purely palliative regimen is right for them, hospice services can help them stay comfortable and maintain their quality of life. Hospice programs also help seniors and their families cope with the terminal diagnosis. From counseling to support groups, these programs help seniors address end-of-life decisions, such as life support and wills. They also help seniors manage the emotional stress they may be feeling about the upcoming months. Patients’ family members – regardless of age – can also benefit from the emotional health services that make up a large component of hospice care. Hospice nurses provide a number of health care services that are specifically designed to help patients keep their symptoms under control. While these services are not intended to increase a patient’s life span, they are intended to improve the patient’s quality of life. These services primarily help seniors manage pain, nausea, diarrhea or constipation, fatigue, appetite loss and other common symptoms. Hospice physicians regularly evaluate the patient’s condition and decide which palliative therapies would provide them with the most benefits. 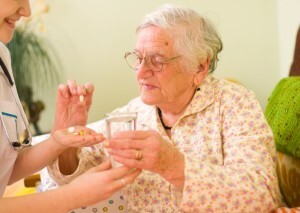 Through hospice, seniors can obtain pain medications (either non-steroidal or steroidal, depending on the severity of their discomfort), wound care, hygienic assistance and other general personal care. Seniors who need help portioning out or remembering to take their medications can also receive this assistance from their hospice nurse. Seniors can also rely on their hospice staff in case of an emergency. While seniors who enroll in an inpatient hospice facility receive 24-hour monitoring, patients who receive hospice services at home also have hospice nurses on-call all day. This provides the patient and their family extra reassurance in case of a medical crisis. Throughout their time with hospice, seniors will be able to work with clergy members, professional counselors or psychologists, social workers and other volunteers who are trained to guide them through the process. While patients may not immediately realize the importance of these emotional care services, they help patients cope with stress, anxiety and fear. Additionally, family members often have access to emotional support and bereavement services through the organization. Author bio: Faith Franz researches and writes about health-related issues for The Mesothelioma Center. One of her focuses is living with cancer. Over the past three months, Houston Hospice has embarked on an employee Capital Campaign to raise funds to build out the third floor of our inpatient unit, the Margaret Cullen Marshall Hospice Care Center, located at the Texas Medical Center. The success of the campaign is not measured by funds, but by employee participation. 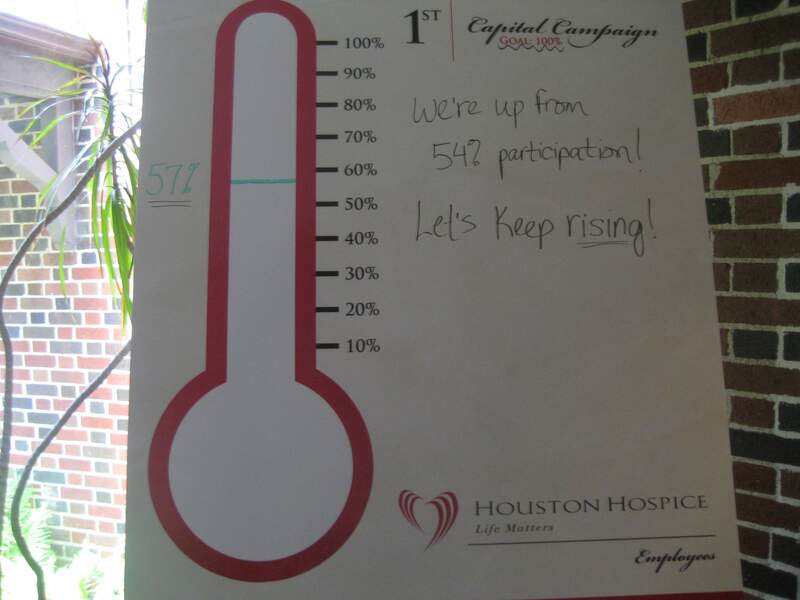 What’s important is to show that Houston Hospice employees support the Capital Campaign and that they are forming a community to show their support. 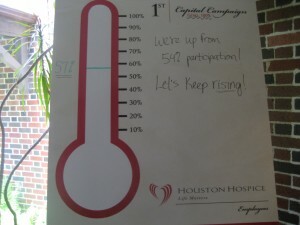 So far, Houston Hospice has 57% of all employees participating in the Capital Campaign. We are proud that more than half of our employees are recognizing the growth of Houston Hospice and are supporting this project. The eager responses from our employees have been overwhelming and touching. We feel very fortunate to have such a caring staff. Once we reach a large majority of employee support, the Capital Campaign will open to outside donors and will apply for grants to contribute to the third floor build out. Once we start building, the project will take roughly six months to complete. The need for a third floor at our inpatient care center is imperative. Many times, we have patients who are on a waiting list to enter our facility. A third floor would add an additional 12 rooms for our patients. With our continuing growth, Houston Hospice is finding a solution to provide more patients with the care they deserve. We are proud and excited to know that our employees are onboard with the Capital Campaign. We hope our employee support continues to grow and that this project will be a large success. In the mean time, we feel very lucky and thankful to work for an organization that has a caring, passionate staff. Houston Hospice will host its annual Butterfly Luncheon on Tuesday, April 10th from 11 a.m. to 1 p.m. at the Hilton Houston Post Oak Hotel. 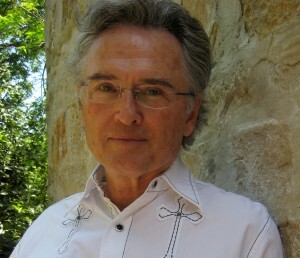 Ron Hall, co-author of the book, same kind of different As me, will be the special guest speaker. The Butterfly Luncheon is the primary fundraiser that recognizes Houston Hospice’s pediatrics program called The Butterfly Program. Profits raised from The Butterfly Luncheon benefit all operations of Houston Hospice. I am very excited about our speaker Ron Hall. His capability to tell a story and paint a mental picture keeps the audience engaged and entertained. 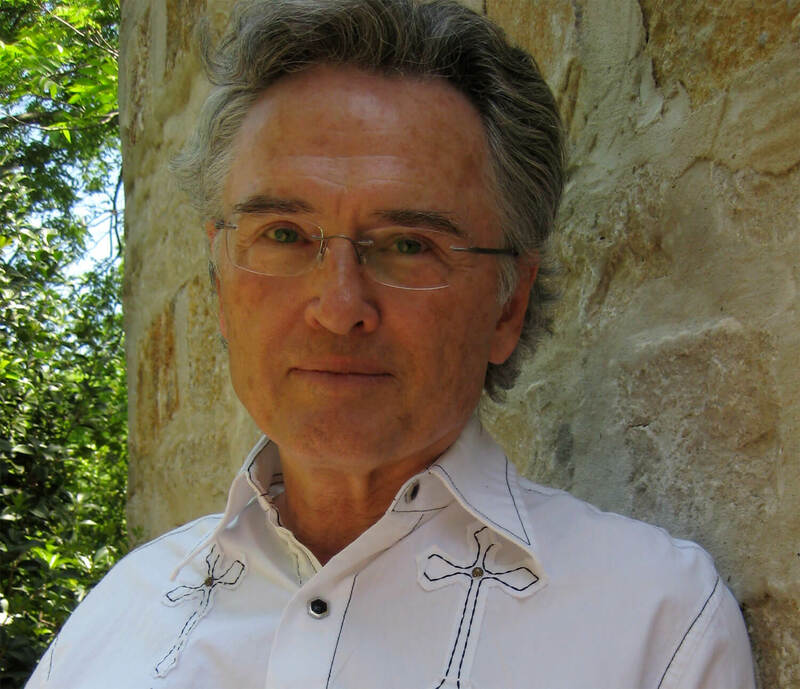 If attending our 2012 Butterfly Luncheon, I highly advise reading his book, same kind of different As me, that Ron co-wrote with friend Denver Moore. The story about how the two met is inspiring especially since they both came from two different worlds. The novel proves that when coping with death, we can all find common ground no matter what our backgrounds are. The event will include lunch and a raffle that will feature our hand stitched quilt sewn by Houston Hospice volunteers. There will also be a booth with sterling silver butterfly jewelry for sale by JD Designs. Copies of same kind of different As me, will be available for purchase. Ron Hall will sign books at the event. If you are interested in attending our 2012 Butterfly Luncheon, you can visit our website at www.houstonhospice.org or contact the Development Department at 713-677-7130. This is one of our major fundraisers for the year and is always a joy to be a part of. Valentine’s Day is a holiday that people love to love or love to hate. Some people love the idea of having a whole day to celebrate their love for their friends, family, and that special someone. Other people believe Valentine’s Day is a made up holiday to generate card, chocolate and flower sales. Whatever your opinion is, as a caretaker acknowledging Valentine’s Day can benefit your loved one. If you take away all of the commercialization of Valentine’s Day what is left? The answer is simple- love. Dedicating a whole day of love for the people in your life is a great way to realize how valuable they are. As a caretaker, you are already a laborer of love. Balancing work and family is stressful enough. You choose to become a primary caretaker because of your deep love for your family member or friend. This Valentine’s Day, take some time to think about the love you have for the friend or family member you are taking care of. In the chaos of trying to create a successful balancing act, it’s easy to forget why you are a caretaker. Think about great memories shared between the two of you and talk about them with your sick loved one. You don’t have to buy flowers, chocolates, or cards to celebrate your love for each other. Also, don’t forget to celebrate the love you have for yourself. Take a moment to think about your characteristics that make you unique and special. When you love yourself you can love others even more. Don’t let yourself forget your worth or that you are a strong, caring person. Give yourself a giant hug and compliment. Even though Valentine’s Day can seem a little over the top and excessive, don’t forget the message of love. Let others in your life know that you love them even if it’s a simple phone call or letter. And celebrate the love you have for yourself. The holidays are a time of the year when people show their emotions the most. Anger, sadness and joy are some emotions people express during the holidays based on their personal beliefs or past experiences. The holiday season also prompts people to share their true feelings with family and friends whether they are good or bad. Sometimes this includes elderly members of our family who believe their years left are numbered and want to make sure their message is heard. When we start to hear our grandparents, parents, aunts or uncles talk as if they might pass away very soon it can be hard to accept, especially around the holidays. We do not want to think this could be their last family holiday function because it puts a damper on the celebration. If you find yourself in a similar situation with a family member over the holidays, here are a few tips I have gathered from my experience working in hospice. If your loved one wants to tell a story or have a serious conversation with you, give him or her, your full, undivided attention and listen. One of the biggest fears we face with death is the possibility of being forgotten. The stories that we have can be passed around and shared with our family for generations. It can be reassuring to your loved one that he or she will be remembered. So, even though you may be hearing grandpa’s fishing story for the 100th time, listen again and tell him that you’ll pass his story on to your grandkids one day. When family members begin to open up and speak as if they have a short time left in their life, ask them questions. This shows them that you care about the life they have lived and that they are significant to you. Ask them for advice and to share the life lessons they have learned. This will make them feel needed and that they are still valued and respected. If a family member feels as if his or her days are numbered, talk to your other family members about it. Building a strong support system with other family members will help ease the pain when a death occurs. Sharing different views and perspectives can also provide a large retrospect about how one person can affect so many lives in different ways. Grandpa’s fishing story may mean one thing to you but something completely different to your cousin. Communicating with other family members can teach you something you never knew about your sick family member. The holiday season can be an overwhelming time. Always be sure to take time and listen to a family member or friend who is trying to be heard. Make them feel important and that their message will never be forgotten. Be patient while listening to the same story for the 100th time and maybe one day someone will do the same for you. Have a safe and wonderful holiday season. When a family member is admitted into hospice care, a variety of emotions come into play. Fear, sadness, anger and relief are felt at any given moment and can often lead to confusion and dismay. During the holidays, these emotions can peak and we can sometimes lose sight of the positives hospice care offers. First of all, hospice care provides an environment where it is safe to say goodbye. 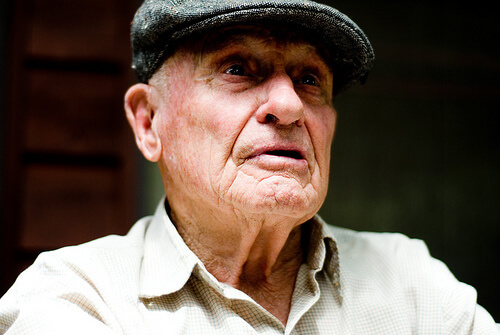 When a patient agrees to hospice care, he or she is giving you permission to say farewell. Family members and friends can focus on their loved one and each other. Also, having family and friends around can offer great validation for those who are having difficulty with the farewell process. In addition, hospice can bring together the patient’s family members and friends. During a difficult time, most families become stronger than ever. They support one another and tend to let go of petty arguments that occurred in the past. Also, family members spend more time together while a family member is in hospice care. They form a bond knowing that they are all going through this process together. 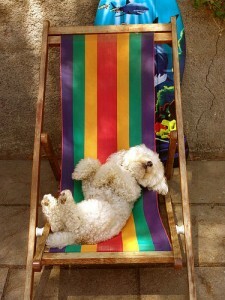 Also, hospice provides a place to relive precious holiday memories as a family. The patient gets to enjoy stories from a variety of friends and family members about holiday traditions and funny memories. This is a great way for the patient and the patient’s family to focus on positive thoughts. Sharing funny holiday stories can help lighten the mood and provide relief to the family members and friends who are nervous or uncomfortable. And finally, hospice allows you to see the kindness strangers can offer. Volunteers and nurses do not stop working during the holiday season and often sacrifice holidays to take care of patients. A hospice staff understands how difficult losing a close friend or family member can be during the holidays. They provide extra support, extra attention and extra kindness to family members during the holiday season. Witnessing these extra efforts can make you appreciate how caring strangers can be at a time in need. Saying goodbye to a loved one is never an easy task and during the holidays it can be more difficult. Remember to try to focus on the positives and don’t be afraid to form a support group of family members and friends. Understand that the hospice staff is there to comfort you and to help you during the holidays. Treasure the precious moments you have with your loved ones, share cherished memories and appreciate the impact the patient’s life has had on you. The month of November has many different observances. From Native American Heritage to Pancreatic Cancer Awareness, the ways to honor November are endless. We are choosing this month to honor Hospice and those who dedicate and provide others with exceptional hospice care. Each November, the National Association for Home Care & Hospice (NAHC)celebrates National Home Care Month, National Hospice Month and Home Care Aide Week to honor health care administrators, nurses, clinicians, therapists, aides, homemakers, chore workers and companions who make a remarkable difference in the lives of patients and their families. This year’s theme for hospice month is, “Loving Care at Home When You Need It Most.” This theme will focus on caregivers who take on the responsibility and stress in assuring their loved one is comfortable. One way to honor Hospice Month is to honor a caretaker. Being a caregiver is one of the most difficult tasks a person will ever have to face. Caretaking can last as short as weeks and as long as many years. Caretakers must re-organize their priorities in order to give their loved one the best care they can. The added stress can lead to neglecting their spouse, children, job and even themselves. Caretakers never have a moment of peace because if something happens to their loved one off their watch, then they feel guilty. If you know someone who is a caretaker be sure to take this month to honor them in a special way. It doesn’t have to be something extraordinary, but something little. A card encouraging them to keep up the good work can mean wonders to a stressed out caretaker. Offering a set of ears for listening or a shoulder to cry on can show support and provide comfort to caretakers. Another way to honor Hospice Month is to volunteer at a local hospice. Most hospices need help with a variety of tasks from visiting with patients to helping out with administrative work. 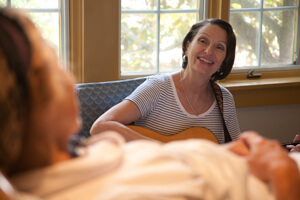 At Houston Hospice we have volunteers who provide our patients with musical and pet therapy as well as volunteers who water our plants. Remember, even the smallest gesture can make the biggest difference. And finally, one of the greatest ways to participate in Hospice Month is to spread the word and educate others about hospice care. This can be done by talking to friends and families about how hospice affects you. Spreading knowledge and sharing insight of your own hospice views and experiences can change a life unexpectedly. Whether it’s a day, a week, or the whole month, remember to acknowledge that one of the many observances of November is hospice care. Showing support and pride will not cost you a thing. If you are proud November honors hospice, wear a burgundy ribbon to represent all who dedicate their services to hospice and caretaking. This month is World Alzheimer’s Month and the 21 specifically is World Alzheimer’s Day. Over 5 million people in the United Statesare currently living with Alzheimer’s disease and Dementia. As awareness is recognized this month for patients with the disease, those giving hospice care to patients should be saluted as well. For each person that is living with Alzheimer’s or Dementia, there is likely to be multiple others working with that person in an effort to provide the total care that is necessary to fight the disease. Alzheimer’s patients often need great care from a hospice or caregiver, especially in the latter stages of the disease as Dementia start to have a greater affect. Even though the month is winding down in the next week or so, there are still plenty of ways you can recognize and increase awareness of the disease. You can have a great impact by wearing purple a few times this month to spread the message of Alzheimer’s awareness. Also, supporters can have an impact on Facebook by changing their profile pictures to the End Alz icon created by the Alzheimer’s Association. This year, supporters are trying to spread awareness of the different effects of dementia. The fact that Alzheimer’s can affect anyone of any race, both men and women of any status or background makes it a disease that people should be highly aware of. Alzheimer’s is a disease that can transform an elderly person who seems independent into a patient who is completely dependent on care giving for their daily activities. Locally, this is where the impact of a hospice can come in. In Houston, there are not only Alzheimer’s patients in need of a care giver, but also patients suffering from multiple other diseases. For many of the elderly living independently, their lives could change overnight. With the help of respite care, the elderly will be given the proper amount of diligence and care in a Houston apartment or home. 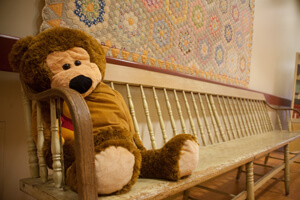 They are cared for by a team of doctors, nurses, aides, social workers, therapists, a chaplain and volunteers. As the month of September draws to a close, we should aim to increase the awareness of this impactful disease by spreading knowledge throughout World Alzheimer’s Month. The effort in these months of awareness has a great impact by informing thousands throughout the world about the importance of hospice and respite care. This article was written by guest blogger Paige Taylor, a recent graduate from the University of Texas El Paso. When friends or family members approach us with a problem they are facing, one of our first reactions is to start talking right away. We either start spitting out phrases of love and support or we start giving advice. Although this is a common reaction coming from a good place inside ourselves, it’s not always the appropriate reaction. 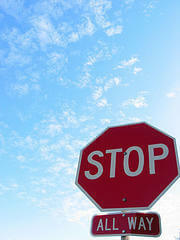 We need to stop and listen to our loved ones. When someone comes to us with a problem, our first instinct is to make the person feel better right away with a loving or supportive comment. While this seems like the correct thing to do, we do not realize we’re not listening completely. The wheels in our brain are turning to find the right thing to say instead of listening to every word and emotion our friend is expressing. One good way to start being a better listener is to eliminate all distractions while a friend confides in you. Choose a quite setting such as a living room or dining room. Make sure the TV is completely off along with other electronics. Turn your phone on silent and allow no extra guests or pets in the room. Be sure to face your friend and make eye contact unless that makes him or her uncomfortable. Sometimes, our body language can mean more than our words. Feed off the energy your friends present and let your actions follow respectively. Lean in to show you’re listening if you’re loved one is speaking softly. Pat the back of their hand if they seem hesitant to share their feelings. Showing your loved ones that they have your undivided attention means more than saying they have your undivided attention. Remain calm by taking deep breaths and focusing on the person. Sometimes our loved ones can drop a bombshell on us and our mind races into panic mode. When that happens, our thoughts become hazy and the loved one no longer has our undivided attention. If bad news breaks, repeat in your head, “I’ll worry about that later—what is my friend saying right now?” Having this calming presence will help your loved ones feel safe and composed. Listening is a skill that takes much practice. Having a busy agenda can make people forget how to listen effectively. Remember to practice this skill with the people in your life in everyday situations. Ask friends to tell you about their weekend. Do not speak until they are completely finished, and then see what all you can repeat back. This fun exercise can help sharpen your listening skills and prepare you for when listening matters the most.